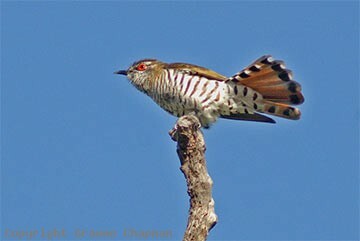 Previously known as Rufous-breasted Bronze-Cuckoo, these days it depends on which book or checklist you look at as to whether it is regarded as a subspecies of the Little Bronze or as a full species. 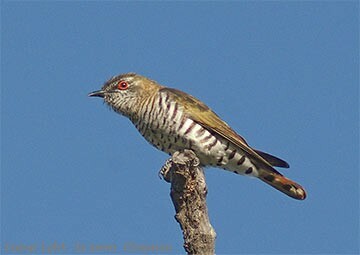 The Little Bronze-Cuckoo complex is quite complicated and not very well understood - there are many other species and subspecies outside of Australia. If this sort of thing interests you, HANZAB is a good starting point - there the Little Bronze and Gould's are treated as full species, hence my arrangement here. Supposed intermediates occur in NE Queensland but whether they are hybrids between the two forms or whether we just don't understand enough about sequences and variations in plumages nobody knows. Those who are familiar with the two species in the field claim that they are found in different habitats and they parasitise different species. They also reckon that the calls are slightly different, but I can't tell the difference. It would need a very experienced observer to pick it. In Australia the distribution is from Byfield near Rockhampton northwards up the coast to Cape York. 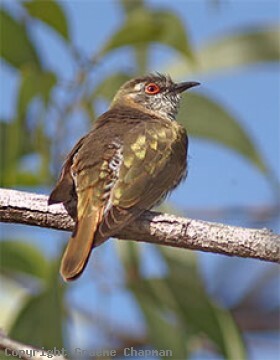 Unsubstantiated records from south of Rockhampton are complicated by the presence of the very similar Little Bronze-Cuckoo. 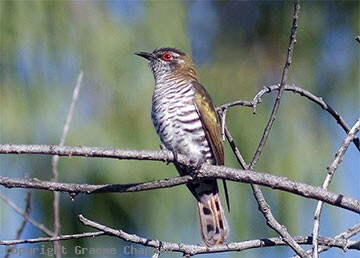 Outside Australia, Gould's Bronze-Cuckoos range as far as Borneo and the Phillipines. The most obvious field marks for a Gould's are the rufous wash on the upper breast and sides of the neck, (white in a Little Bronze) and a bronze iridescence on the upperparts, including the cap (see comparison pics under Little-bronze). The Little Bronze is glossy green above usually with a darker cap. Gould's show a preference for fairly dense vegetation such as mangroves, coastal and riverside rainforest where the principal host is the Large-billed Gerygone. 346201-D ... Gould's Bronze-cuckoo, male, Balgal Beach N.Q. 346202-D ... Gould's Bronze-cuckoo, male. 346203-D ... Gould's Bronze-cuckoo, male. 346204-D ... Gould's Bronze-cuckoo, male.